St Michael and All Angels Church is a small village church in the Parish of Church Stretton. It was opened in 1902 as an Anglican Church. The Church is built of stone from the local quarry. 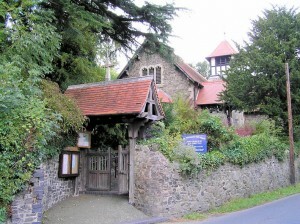 The Church, set in its hillside garden is about 280 metres from the centre of the village, is open for private prayer and reflection from 10.00am to 4.00pm daily. 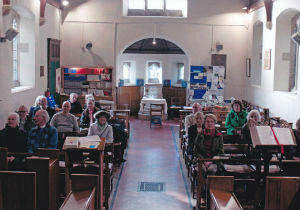 When the United Reformed Chapel in the village had to close in the 1980’s, as it was in need of repair, the congregation of St Michael’s offered the use of their church when it was not in use on Sunday afternoons in winter and Sunday evenings in summer. However the two congregations later chose to merge and in 1994 a Local Ecumenical Partnership was set up between the Anglicans and the URC. At present we have our own URC minister and share the Ministry Team from St Laurence’s. We meet at 10.30 a.m every Sunday morning for either Morning Worship, Anglican Communion, URC Communion or sometimes other styles of Worship. We benefit from the support and oversight of both Churches. We seek to worship God in Spirit and in Truth and to promote the Good News of Jesus as found in the Bible. We are an open and welcoming church to everyone. It is a place where we can find friendship, encouragement and support as we seek to live out our Christian Faith. A Study Group meets on Mondays (fortnightly) at 7.30pm in someone’s home. Please contact the minister for further details. Every Friday at 8.30 am there is a prayer time in the church. In autumn and winter Soup lunches are held in the Vestry on the third Wednesday of the month at 12noon. During Lent these are held weekly on a Wednesday. In spring and summer ‘Coffee and Cake’ is served at 11.00am on the third Wednesday. The village has always had a strong sense of community and cohesion, much of which centres on the Village Hall and in whose life St. Michael’s people join with enthusiasm. The keen flower arrangers from the village help to make the church look most attractive for special occasions . As a Christian fellowship we support hospital work in Lesotho, the Barnabas Fund, Water Aid and the local charity The Ark which helps homeless people in Shrewsbury. For further details, please contact Hazel Allen by email or phone - 01694-751400.